Trepanning, also known as trephining, dates back at least 7000 years to the Neolithic period. Derived from the Greek meaning to auger or to bore, trepanning is a surgery in which a piece of the skull is removed by incising the skull with a knife or, after the discovery of metallurgy, drilling a circular hole using a metal bit. Anthropologists have presented a number of theories as to the motivation behind trepanation. Some have argued that its purpose was to facilitate the entry or escape of spirits, while others have surmised that the round pieces of skull removed were used as amulets. It may have been used as therapy for headaches, epilepsy, or insanity. What is certain is that by the time of Hippocrates trepanation was used to treat skull fractures, by removing broken pieces of bone and relieving intra-cranial pressure. We know that this surgery was quite common and that the survival rate was relatively high by the number of skulls uncovered by archeologists with evidence of healing around trephine holes. The saw pictured here is of a pattern more than 2000 years old, as evidenced by finds in Celtic graves along the Danube, but is named after the eighteenth century surgeon William Hey (1736-1819) of Leeds. 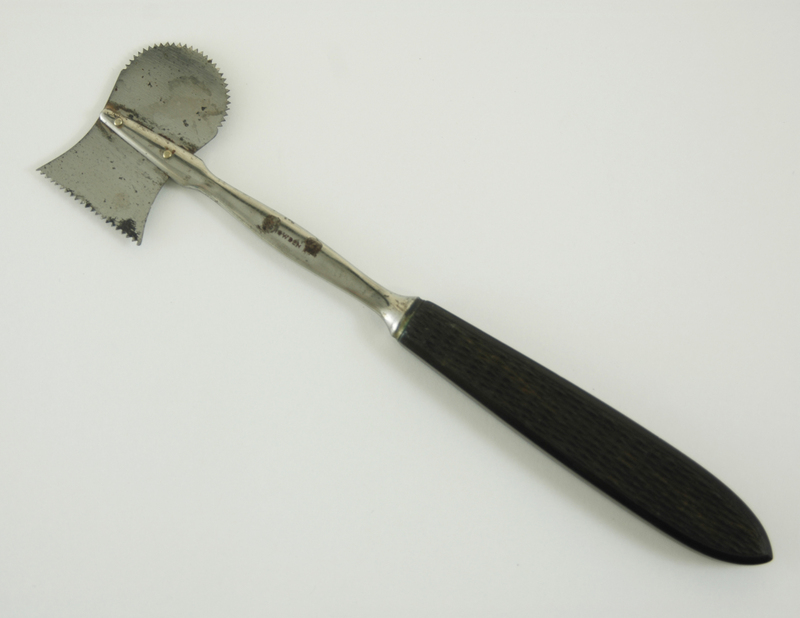 Hey’s saws were a common surgical instrument in medical kits of the eighteenth and nineteenth centuries.